Meditation doesn't necessarily mean you need to sit crossed leg like indian yogi with eyes closed. Deep, absorbing thoughts also mean meditation. You can meditate with your eyes open looking at an object with clear consciousness and thought process. Here is a meditative Quranic verse followed by a link to a awe-inspiring presentation link. click on the link after reading the verse and you will see what i meant. Assuredly the creation of the heavens and the earth is a greater (matter) than the creation of men: Yet most of mankind understand not. The Quran 040.057. Florida State University in Tallahassee, Florida has put up an awe-inspiring page on their site. 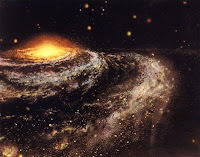 It begins as a view of the Milky Way Galaxy viewed from a distance of 10 million light years, and then zooms in towards Earth in powers of ten; 10 million, to one million, to 100,000 light years and then it finally reaches a large oak tree. If ever there was a witness to the wonder of God’s creation, this has captured it. :: With gratitude to the beautiful blog Darvish. :: Relate post: First post on the series of Meditative Quranic verse. See all related posts.